This is the simplest way to fix a squeaky desk chair. All it requires is a screwdriver. Before you begin, take a few minutes to locate all the screws. 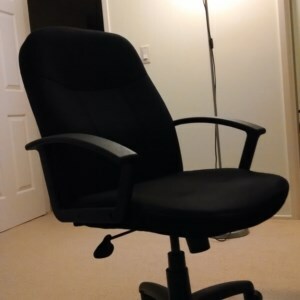 Mine had 4 screws on the bottom of the chair, and 4 screws holding each of the two armrests. The most common places are under and on the side of the chair. It will be easier to tighten screws if you flip the chair upside down. The second method to fix a squeaky chair is to lubricate any areas where the chair rubs together. Depending on the material of the chair, you will need to take a different approach. For desk chairs, the contact point is more likely to be metal. To find contact points, you may need a flashlight to get to hard to reach areas. Use a lubrication like oil, WD40, or silicon spray lubricant. Note that these may cause a mess, so it is wise to attempt this repair outdoor in well ventilated areas. Other chairs (like dinner table chairs) may be made of wood. These kinds require a wax to reduce gaps. I first attempted to tighten the nuts and bolts. Surprisingly, of the 12 screws and bolts that I located on the chair, five of them were loose and required tightening. Unfortunately, tightening the screws did not help with the squeakiness. My next attempt was to add grease to the various contact points. Mine was a metal chair, and locating the various points did require a flashlight. It took about 2-3 iterations of spraying grease and testing before the solution was finally fixed. I began by spraying contact points visible from the outside of the chair. I then proceeded to spraying points inside the metal component that I could only see with the help of a flash light. This also did not help. My final attempt was to spray a section of the desk chair between multiple metal contact points. The circular bars that support the chair when the chair is rocked back and forth. That instantly fixed the problem from lots of squeaks to not a single sound. I don't yet know how long this change will hold, but I barely used any part of my can of lubricant, which I have used elsewhere in the house. If the squeaks come back, I can use the same can of grease to apply the fix over again.